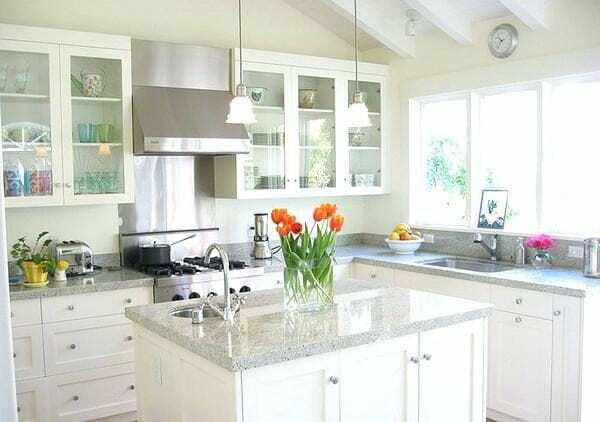 FeastHome – The white color kitchen represents purity and goodness. It’s also a color that has a very strong meaning. It’s the color of truth, power, and perfection. Technically, white is not a color. It’s a manifest of all colors. You can combine white with all of the colors you can find out there. The level of flexibility for white is the highest. 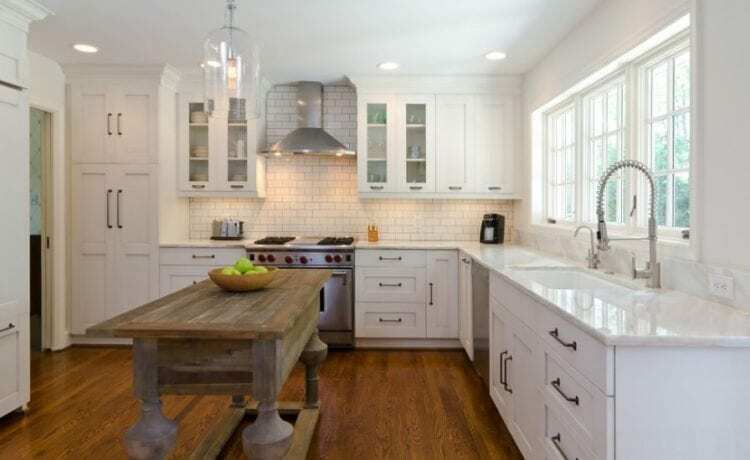 People use white as the base of any room including the kitchen. 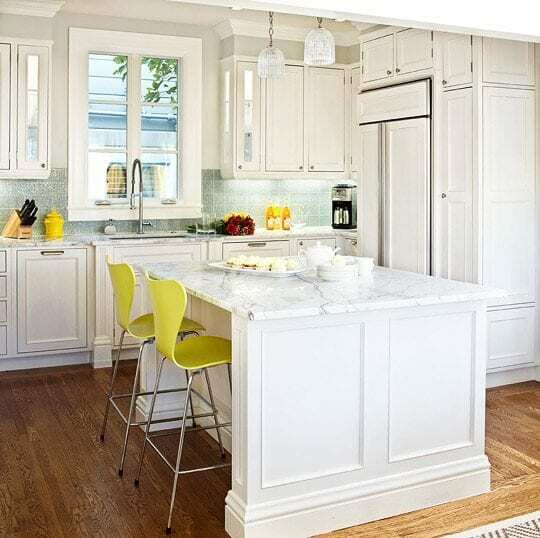 The basic color white is the safest choice you can go with when designing a kitchen. It could follow wherever you want to go with your kitchen design. Take a look at the traditional texture of this kitchen. It’s proof that a white scheme room doesn’t have to be plain and boring. It could also be textured, cozy, and homey. With the U concept, a large kitchen can be so much efficient for your cook flow. You can easily access any counter you need. It’s even better if the kitchen is small or narrow. The white color scheme really brings a soothing and cool atmosphere into your kitchen. The natural lights from the outside during the day really shine the kitchen brighter. Any white room needs one or two elements to dim the brightness. So, dark wood flooring is used. Many designers would recommend having white or bright color for a small room. It doesn’t mean that white color couldn’t go well in a large space. 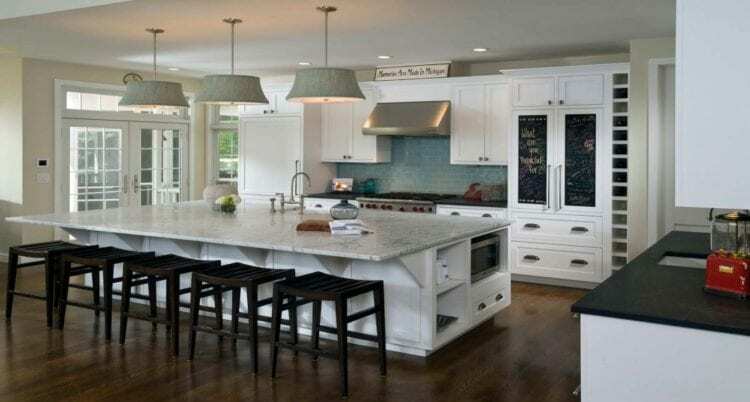 As you can see, you can work with white color in such a large open kitchen with a huge kitchen island. But, you have to add enough accents color to keep it comfortable for your cooking and other busy activity in the kitchen. 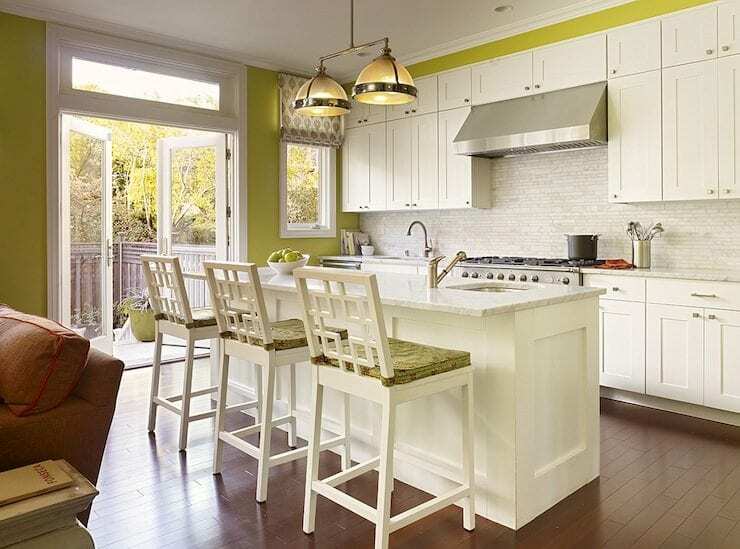 To add a touch of nature and freshness into the kitchen, a shade of green may be a perfect choice. The designer decided to have the wall in avocado green. He actually made a great choice because it makes a good statement in the room because of the main color. The avocado green color is only taking a few spaces in this kitchen, but it’s making such a big impact to color this white kitchen. This modern white kitchen doesn’t have any traditional touch in it. All of them seem to be having an only modern vibe, from the cabinet set to a breakfast nook. This small modern kitchen looks spacious because of the brightness made by the outdoor light. The light brown flooring creates a nice natural touch to keep the white scheme high. 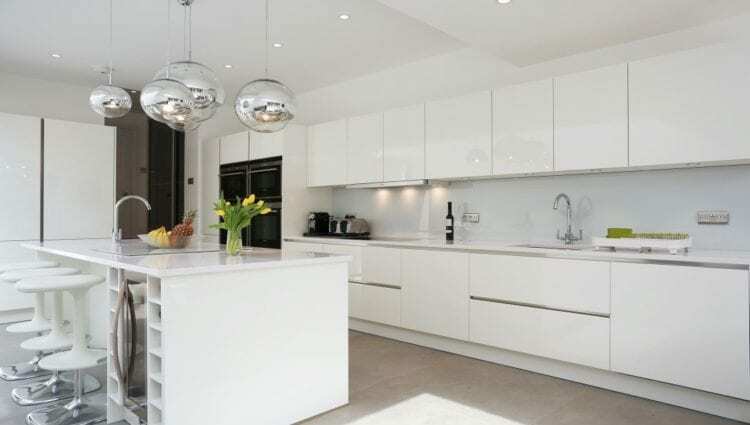 Wood flooring seems to be the perfect choice for a white scheme kitchen. There’s nothing can replace it. It’s the easiest and safest choice a designer could make to keep the white kitchen stunning and comfortable. The wood flooring in this kitchen keeps the kitchen in its perfect bright. 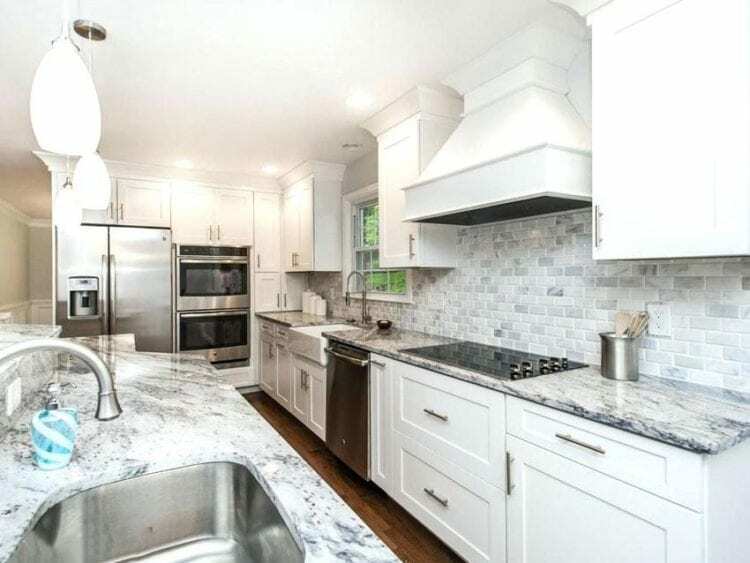 Well, you can’t have a kitchen too bright. 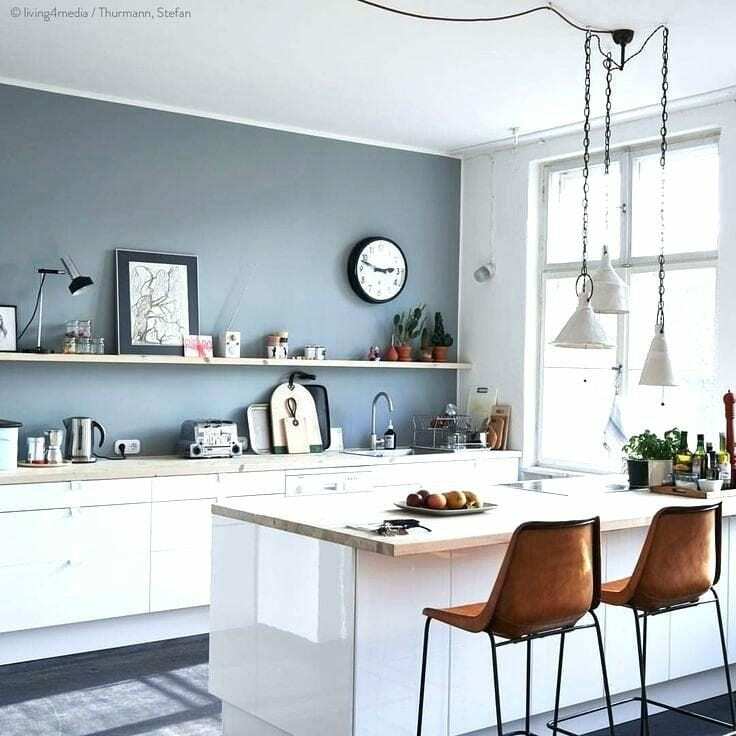 A soft hue of blue on the walls could really steal attention in your kitchen. 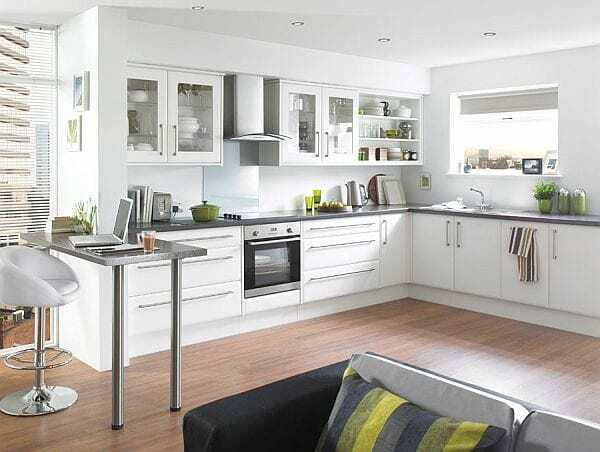 It’s recommended to choose soft hues when you need the kitchen to be soothing and harmonious with the white scheme. You can have bolder colors from the accessories you add. 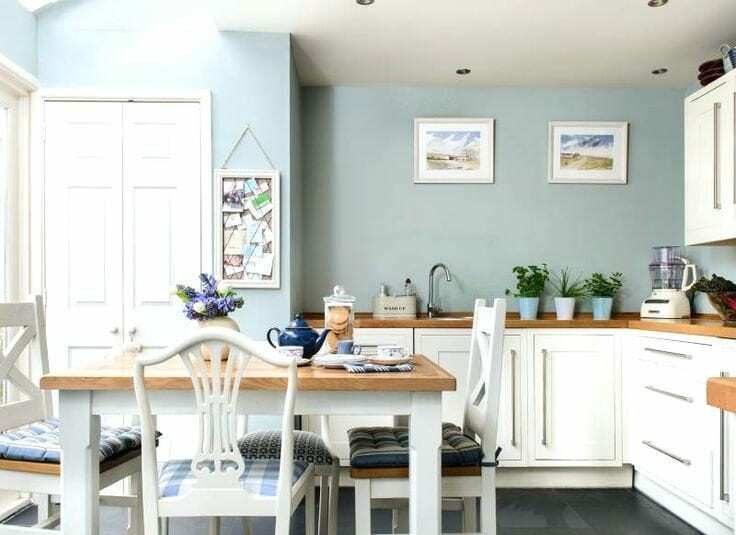 It’s another shade of blue you can choose for your bright kitchen. If you are intended to make your kitchen soft and soothing, this is the blue shade you have to go with. The hue is quite specific and it resembles the color of the sky. So, it’s guaranteed to be cool and comfortable. As said, you can’t go too bright to a kitchen. The flooring and countertop is the element to dim the brightness. 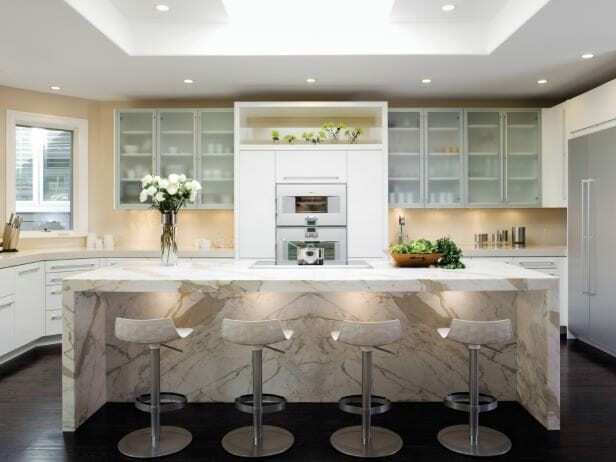 Granite and Marble materials are the must-have elements for a kitchen. Those materials offer a natural pattern that accentuates the white surroundings. It dims the brightness a little bit and adds more texture to make your kitchen more impressive and also functional. One element the really catch everyone’s eyes is the material that is used for the countertop. On the island, it’s got a built-in small sink and it’s centerpiece by a beautiful flower. That’s something you need to see in a kitchen. 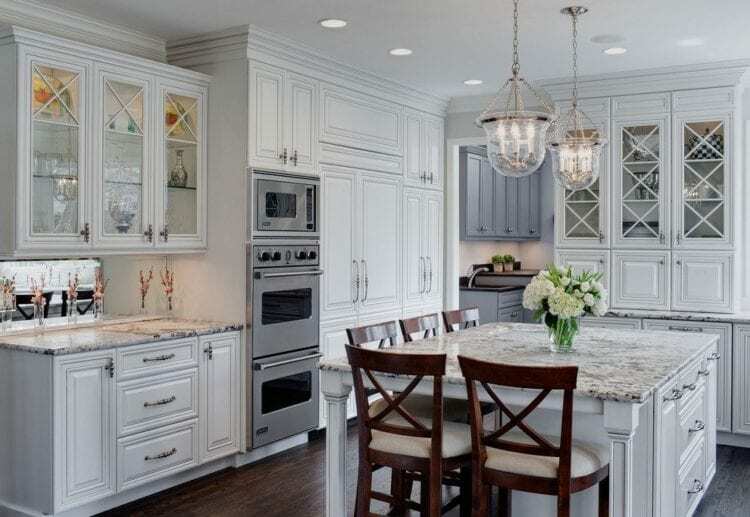 Some homeowners try to avoid having a kitchen with white colors all over the space. It’s possible to do. In order to design it right, you have to know how to accentuate it with decors. This kitchen is full of decors that give splashes of color to the kitchen. The style of Scandinavian is pretty popular lately. It’s got a sleek white scheme that will brighten up your day. This kitchen also has a cool and modern feel. The kitchen island is a focal point of a kitchen. Having it to stand out is the key to a well-designed kitchen. This kitchen has successfully done it. There’s no doubt that the color of white is the freshest color you can have for your house. Looking at this long kitchen space, you will get it. The glossy effect is quite exciting. 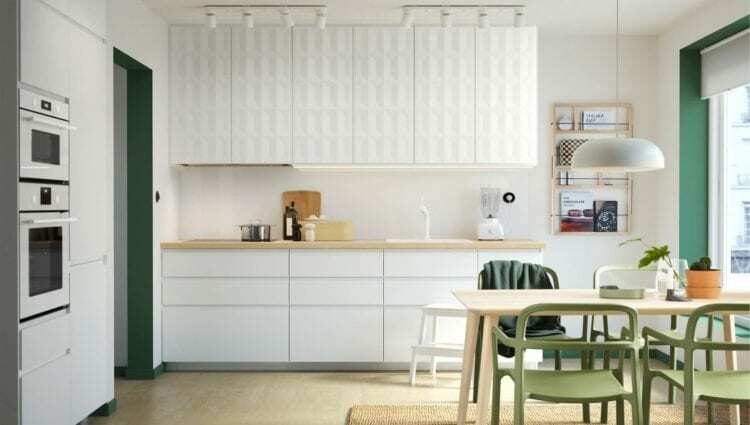 You can have a glossy kitchen cabinet to strengthen the statement of the white scheme. It also reflects any lights that are provided for the kitchen. It’s even better with that super-glossy spherical light pendant. The elements of this beautiful kitchen look really harmonious. 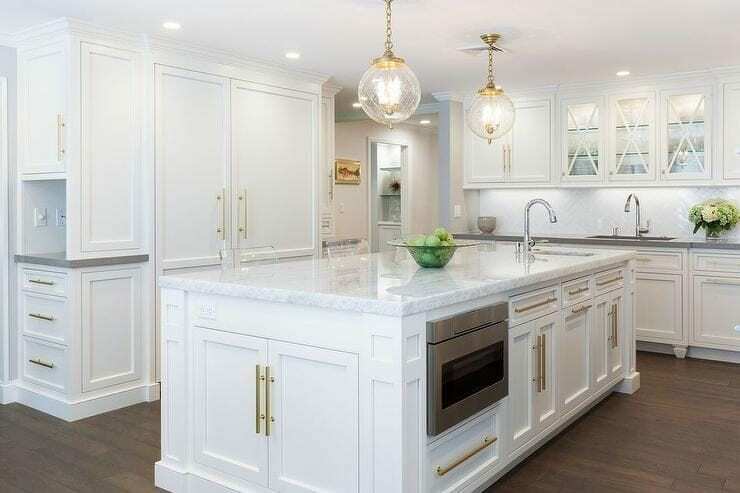 Some touches of gold are added to increase the luxury of this clean white kitchen. The white color symbolizes purity and goodness. It was very clear when you choose white as the main color of your kitchen; you will feel the entire positive atmosphere.